Helloo to all you wonderful readers of Becca's blog! My name is Abigail and you may know me from my own blog Polished Dreams or Instagram. I am very honoured to be doing a guest post for Becca whilst she's living it up on holiday and going to Polish Con! No jealousy at all here, nope, none whatsoever... Anyway, I guess I'd better get on to the nails! It took me a little while to figure out what to do for this post because I wanted it to be reallyy good but I got there eventually! As you can see, I settled on doing a watermarble as I'm really into it at the moment which is both stressful (when it goes wrong) and amazing (when it goes right). Fortunately this one was definitely a time when it went right! 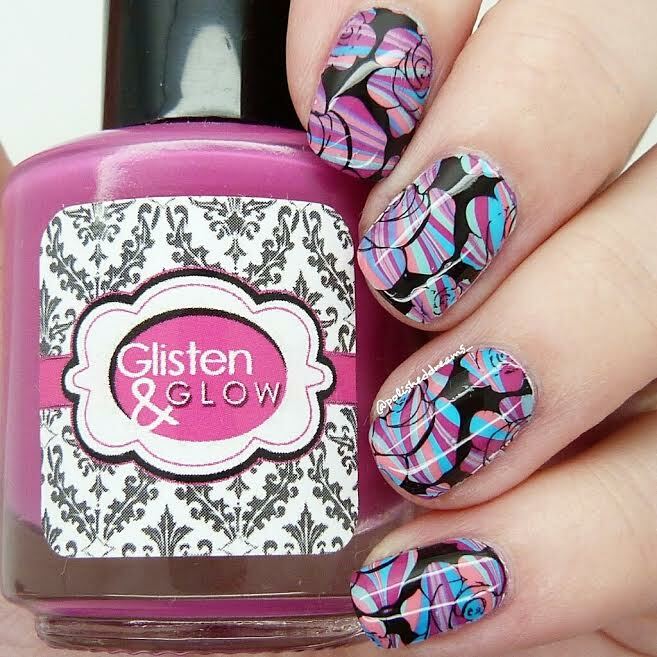 For my watermarble I used the Experience the Islands Collection from Glisten & Glow. I bought this collection recently from Rainbow Connection and I am absolutely in love! 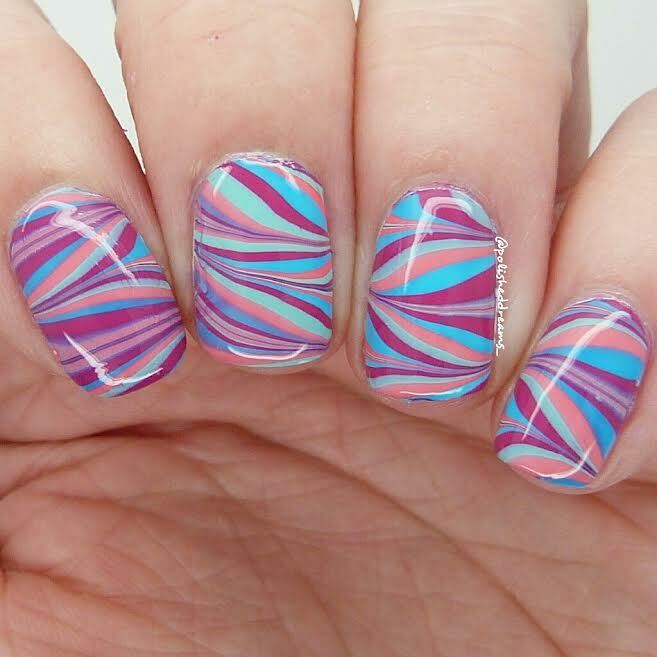 They watermarble beautifully which obviously makes my life so much easier as a watermarbling novice. I've also recently starting using the Whats Up Nails Watermarble tool which I got from Nail Art Uk and that has seriously helped improve my watermarbles dramatically so I definitely recommend it. To finish off the mani I used my favourite topcoat which just so happens also to be by Glisten & Glow and is of course HK Girl. This post isn't sponsored by G&G I swear! Now usually when I do watermarbles, I'm so happy that I've managed it I'd never dream of covering it up with anything else. This time however, I thought I'd be a bit more exciting. I used Hit the Bottle As Black as Night (which I also got from Rainbow Connection) and UberChic Beauty 1-02 to stamp this very popular rose image over the top. I think really I prefer the watermarble on it's own but hey, I tried something new and that's what counts right? 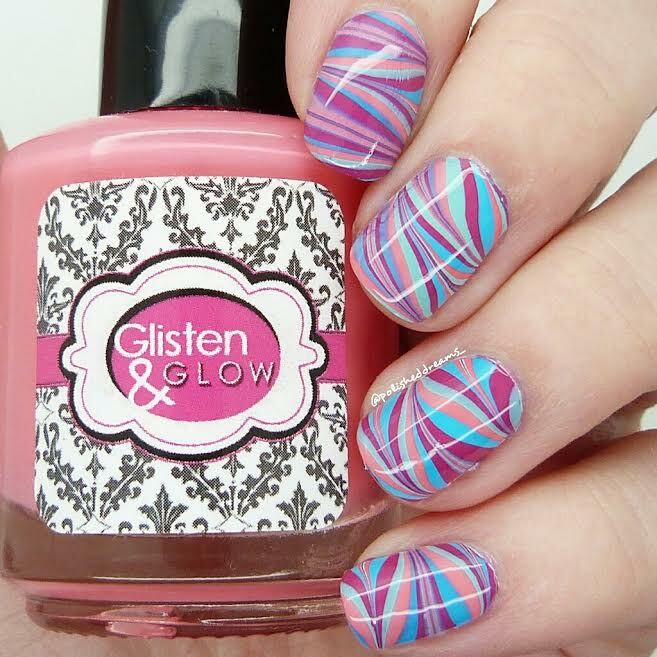 I am seriously in love with this mani though. I even got a "Oh wowee, that's super cool" from my boyfriend which as I'm sure you can imagine is a pretty impressive comment to have about nails from him haha! Well, all that is left to say is a very big thank you to Becca for having me on her blog! I hope you have a fab holiday and enjoy your time away and of course Polish Con! For all the people who read this post, I will leave all my links down below so you see a bit more of my work if you're interested. Hope you enjoyed reading! Love this water marble, it's gorgeous! I've never seen one so pretty.